Shakshuka is an amazing recipe of sauteed peppers simmering in a tomato sauce, and then you add eggs to poach in the tomatoes. 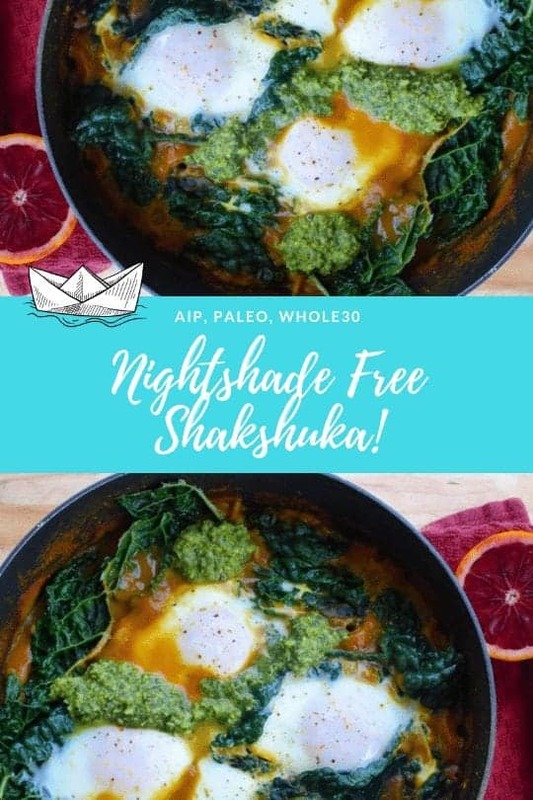 This is a nightshade-free shakshuka and proof and anything is possible and that those of us with Nightshade Intolerances can get very creative! 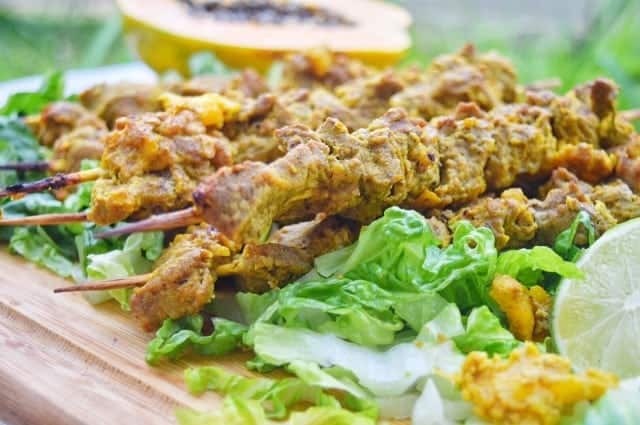 A colorful, warm and so flavorful meals that you just can’t live without! 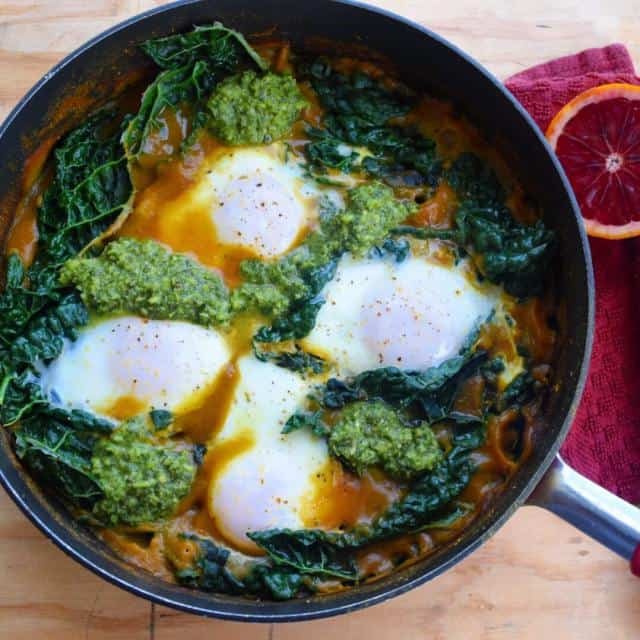 Every time a beautiful skillet of simmering tomato & eggs popped up on my feed I just drooled. Tomatoes are a no go for me, so I would need a FAUX-MATO sauce to make this happen. The Urban Poser has a good one. My roasted beet Marinara from Made Whole cookbook would work too! Instead of peppers, I cut my carrots in long thin strips & used the chimichurri to recreate the salty tangy garnish of feta & parsley. I’ll tell ya… it was delicious! 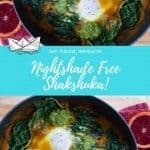 Nightshade free shakshuka is born! Cut carrots & onion in long thin strips, julienne. Mince garlic, remove stems from kale & set aside. 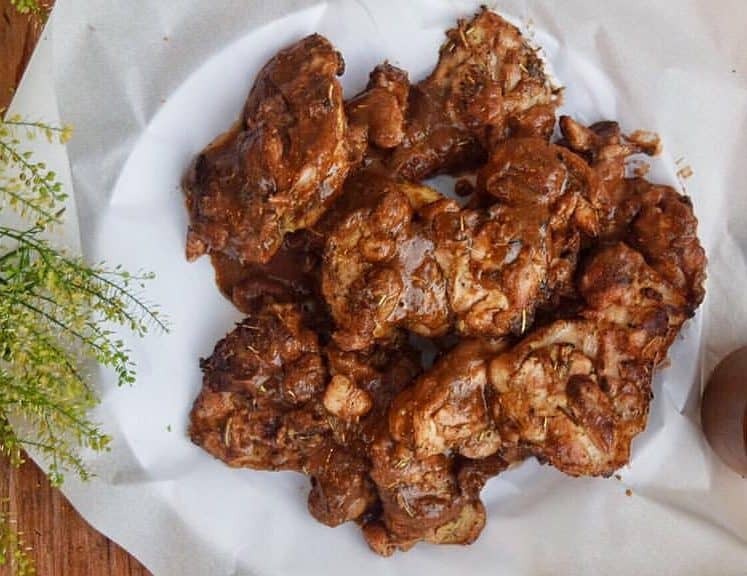 Heat coconut oil in a large, deep skillet. Add in onion, carrots, garlic & bay leaves. Saute on medium until onions are tender. Add in no-mato sauce & seasoning, let it simmer for 5-8 minutes. 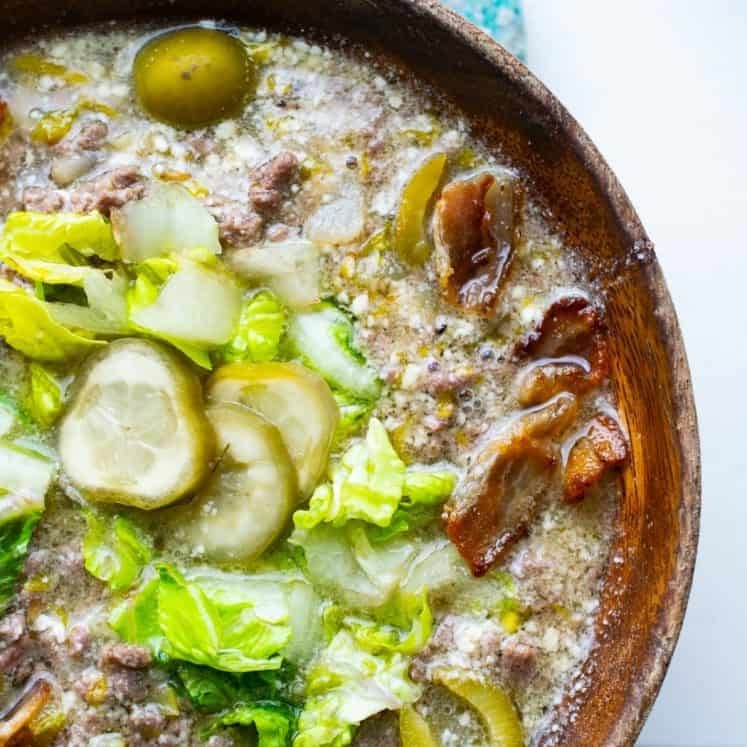 Stir in bone broth, especially if it’s getting too thick. Layer the kale over the sauce mixture, let them wilt a little. Do not mix in. Crack eggs into skillet and cover with a lid partially. Let it simmer until the egg whites are no longer translucent. If you do dairy, go ahead and crumble a little feta, if not I highly recommend the chimichurri. 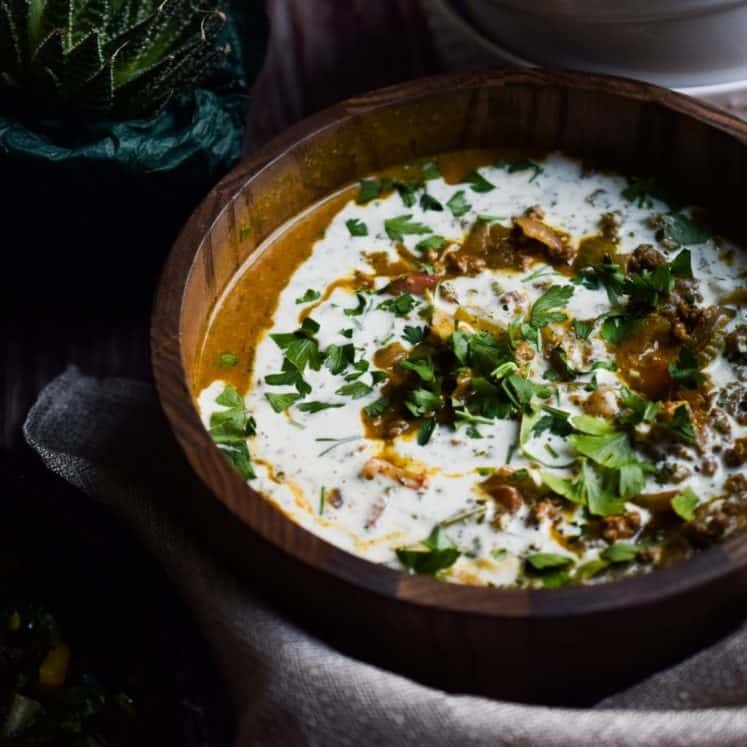 Serve alone, with cauli rice or roasted sweet potato 🙂 Dazzle everyone at brunch.